This tote bag knitting pattern was inspired by the Aran laptop cover pattern that I saw at the Canadian Living’s website. This is not a very big bag. 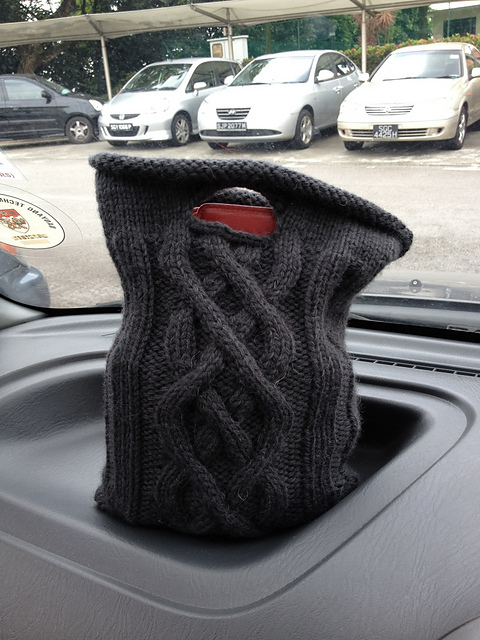 It is just big enough for my wallet, mobile phone, tissue and, some knick-knacks. The central panel is made up of a wild oak cable “borrowed” from the Aran laptop cover. It is knitted in the round so you need to mark out the left and right side of the bag so that you can repeat the pattern twice. I used 1 hank of Wool of the Andes Bulky Yarn (color: Storm) from Knitpicks. I like the feel of the Peruvian wool on my needles and it blooms slightly after washing. You can use bulky yarn from any brand but wool is probably best. Cast on 80 stitches. Join in the round and knit 1 row. Place a stitch marker to indicate the start of the round. Count 40 stitches and places another stitch marker. 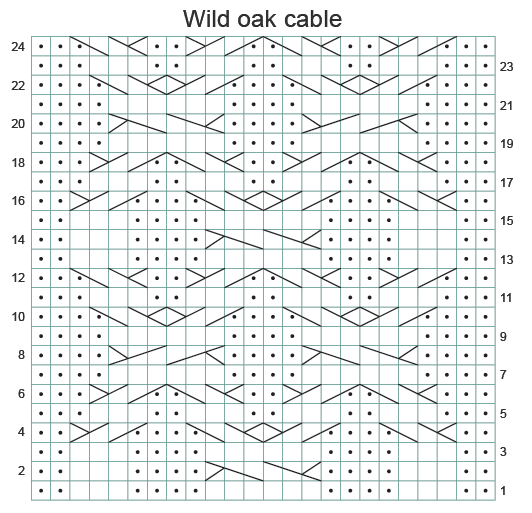 The instructions in the square brackets are for the wild oak cable central panel. Row 1: K3, P2, K3, [P2, K3, P4, K6, P4, K3, P2], K3, P2, K3. Repeat one more time. 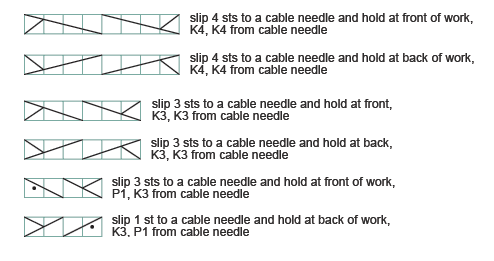 Row 2 to 13 makes up one complete cable pattern. Repeat the pattern 3 or more times till the desired length. If you prefer the chart version, I’ve attached a screenshot of the chart from the original pattern. Source: Canadan Living. Knit all stitches for 10 rows. Sew up the bottom seam of the bag using back stitch or mattress stitch. To finish, line the Aran Cable Tote Bag with fabric. If you like this pattern, you might also like my knitted Japanese knot bag pattern.